Enabling BitLocker in your Microsoft Windows OS is a good step to secure it especially if it’s installed on laptop or other portable devices that is easily to be stolen. Once you have enabled it, it will encrypt all files stored on the drive Windows is installed on, so that all these files and drives cannot be accessible by unauthorized users if your laptop is stolen. This is important security feature which you should enable especially if you store important and sensitive files on your laptop. Once you have enabled it, you can log on and work with your files normally, but BitLocker can help block hackers from accessing the system files they rely on to discover your password or from accessing your drive by removing it from your computer and using it on other computers. BitLocker uses a TPM (Trusted Platform Module) to provide this full disk encryption protection for your data, and so your laptop must support TPM in order to use this advanced security feature. Please note BitLocker can only be enabled in Windows Vista Ultimate or Enterprise editions, Windows 7 Ultimate or Enterprise editions, Windows 8 Pro or Enterprise editions, Windows 10 or newer Windows operating system. 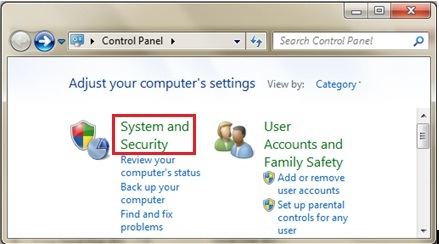 2) Control Panel window will appear, go ahead to click on System and Security. 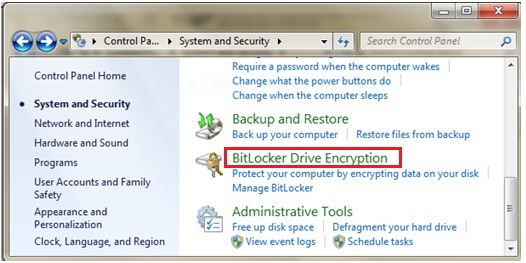 3) Scroll down and click on BitLocker Drive Encryption. 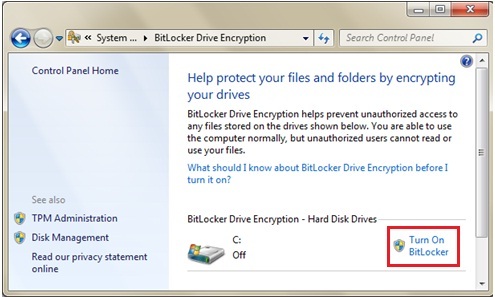 4) BitLocker Drive Encryption window will be opened, you can then proceed to turn it on by clicking Turn On BitLocker for selected drives. Note: You will get following error if your laptop doesn’t contain TPM chip or the BIOS doesn’t support TPM. 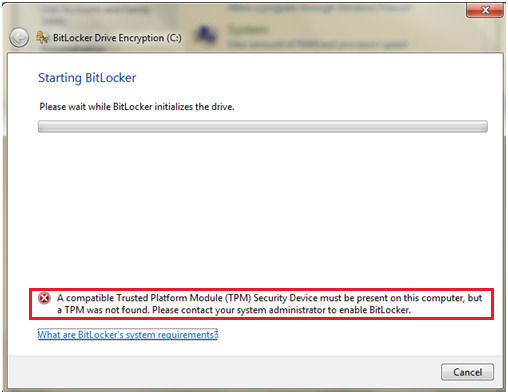 If your laptop supports TPM, you must enable or activate it before enabling BitLocker. 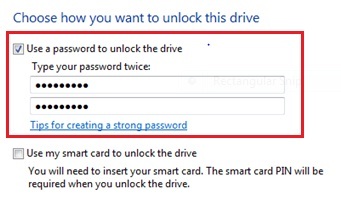 Note: If you encrypt data drives (fixed or removable) with BitLocker, you can unlock an encrypted drive with a password or a smart card as shown below. Note: In case you forget password or lose smartcard, you can store and use this recovery key to unlock your encrypted drive. Remember to save the recovery key file at a secure drive location. Return to top of "Enabling BitLocker to Secure Microsoft Windows"! !